Where have I been? It sure hasn't been in here posting fun projects like I should be! I made this card about a week ago and took a quick picture before my team at work gave it to our trainer at work. 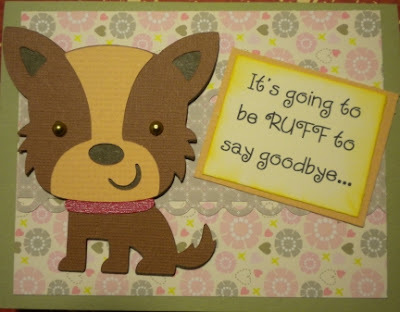 She flew back and forth between Bismarck and Boise during an 8 week period to get us all trained up and last week was her last week with us, so we wanted to honor her with a goodbye card. Of course, your's truly had to make the card! :) She has a love of rat-terriers and so I thought what better than getting out my Create a Critter cartridge and firing up the cricut. I pretty much had to dust the poor thing off because it has been sorely neglected as of late. I made the verse with my computer and the rest pretty much speaks for itself. Happy Crafting! Stay tuned because tomorrow night at 11pm mountain standard time, I will post my craft for the big "It's a Small World" Holiday Blog Hop. Please come back by and say hello. There will (of course) be a giveaway!